In DUG Insight, wavelets are created and managed in the Wavelet tab. For starters, see Creating a Wavelet Field to create and configure a simple Ricker wavelet (a.k.a. Mexican Hat wavelet). Location-/time-varying wavelets can also be created or loaded within a wavelet object for interpolation of wavelet between different locations/times. For more information, see Location-/Time-Specific Wavelet. Based on the defined parameters, the wavelet is displayed in the wavelet preview window in the Details Panel. The display of the wavelet can be adjusted by right-clicking in the wavelet preview window to bring up the context menu and selecting Configure Track (see Configuring the Wavelet Preview Window). In addition to creating a wavelet field, Insight also allows for extraction of wavelets from seismic data. Statistical Wavelet Extraction — This process uses the inverse Fast Fourier Transform to extract the wavelet from a seismic volume. As a prerequisite, a probe is needed to define the block of seismic data to be used in the extraction (see Creating a Probe). Bayesian Wavelet Extraction — This process uses the Bayesian statistical analysis to extract the wavelet from seismic data. Note: This process only runs on Linux. Spectra Analysis Overview — Spectra Analysis allows you to view and compare the spectra of volume traces and wavelets. 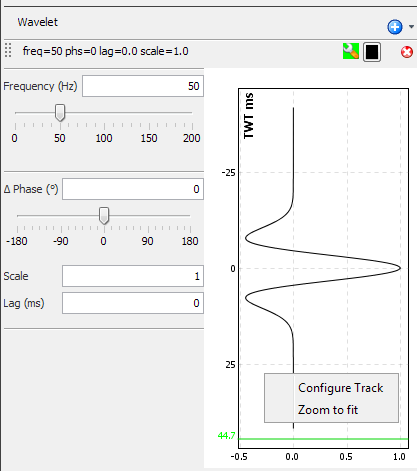 You can also create plots to compare different wavelets based on time, frequency and phase. Synthetics Overview — In Synthetics, wavelets are used in conjunction with seismic data to generate synthetics. If you already have a wavelet, you can import it into Insight via the Import menu in the Control Panel (see Importing a Wavelet). Insight supports import of wavelets in .wf and .su formats, and wavelets saved as text files. Wavelets can be exported as a .wf (wavelet field) file by right-clicking on the wavelet in the Wavelet tab and selecting Export. For a full list of import/export formats acceptable in Insight, see Formats accepted by Insight for import and export in the FAQ.